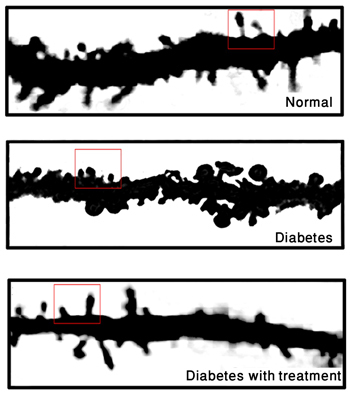 Normal dendritic spines — microscopic projections on the receiving branches of nerve cells — are shown at top compared to those of diabetic rat. At bottom, spines after receiving treatment. Yale study suggests that neuropathic pain associated with diabetes may be caused by reshaping of these spines in nerve cells, and might be treated by drugs. Yale researchers have identified the source of neuropathic pain that many diabetics suffer from and believe they may be able to target it. While working with rats, the researchers found that changes in the structure of dendritic spines are associated with pain and they also found a drug that interferes with formation of these spines, reducing pain in lab animals. Nearly half of all diabetics suffer from neuropathic pain, an intractable, agonizing and still mysterious companion of the disease. Now Yale researchers have identified an unexpected source of the pain and a potential target to alleviate it. A team of researchers from Yale and the West Haven Veterans Affairs Medical Center describes in the May 15 issue of the Journal of Neuroscience how changes in the structure of dendritic spines – microscopic projections on the receiving branches of nerve cells — are associated with pain in laboratory rats with diabetes. With a growing number of diabetics, the condition represents a huge unmet medical need. Once neuropathic pain is established, it is a lifelong condition. “Here we reveal that these dendritic spines, first studied in memory circuit processing, also contribute to the sensation of pain in diabetes,” Tan said. A single neuron may contain hundreds to thousands of dendritic spines. The Yale team led by Tan and senior author Dr. Stephen G. Waxman, the Bridget Marie Flaherty Professor of Neurology, professor of neurobiology and pharmacology, found abnormal dendritic spines were associated with the onset and maintenance of pain. They also found that a drug that interferes with formation of these spines reduced pain in lab animals, suggesting that targeting abnormal spines could be a therapeutic strategy. Tan said that these dendritic spines in nerve cells seem to store memory of pain, just as they are crucial in memory and learning in the human brain. “We have identified a single, key molecule that controls structural changes in these spines and hopefully we can develop therapeutic approaches that target that molecule and reduce diabetic pain,” Waxman said. The research was funded by the Department of Veterans Affairs. Be the first to comment on "Yale Neurologists Discover the Source of Diabetic Neuropathy Pain"